JMC seniors had a chance to meet and learn from professionals in their field on Nov. 1. The department’s annual Meet the Pros events hosted professionals in advertising, graphic communications media, journalism, public relations and TV production. Advertising students were able to listen to Jamie Futrell, general manager, Bristol Broadcasting, Paducah; Areia Hathcock, general manager, Metropolis Planet, Metropolis, Ill. and the Mayfield Messenger, Mayfield, Ky.; Joshua Miller, vice president of digital, 5by5 Agency, Nashville, Tenn.; Karie Thornton, digital sales director, Bristol Broadcasting, Paducah; and Robert Norsworthy, executive-in-residence, Arthur J. Bauernfeind College of Business, Murray State University. Austin Gordon, media specialist, Hutson, Inc., Murray, shared his insights with graphic communications media majors. Journalism seniors heard from Will Brantley, hunting editor, Field & Stream, Murray; Shelly Byrne, reporter, The Mayfield Messenger, Mayfield; and Roger Seay, news director, KFVS-TV 12, Cape Girardeau, Mo. Five visiting professionals shared their experiences with public relations majors. Those speakers were: Tori Daughrity, director of marketing and public relations, Henry County Medical Center, Paris, Tenn.; Dana Howard, marketing communications coordinator, CFSB, Benton; Richard Patterson, deputy public affairs officer, U.S. Army Cadet Command, Fort Knox; Heather Mix, account manager, Bayard Advertising, Nashville, Tenn.; Kallan Bubb, senior strategist, Canvas Worldwide, Los Angeles; and Kayla Speis, director of marketing and communications, Murray Convention & Visitors Bureau, Murray. Television production majors listened to the insights of Jason Barnett, owner/creative director, Jason Barnett Graphics, Louisville; Kyle Hayden, local sales manager, WPSD-TV, Paducah; and Jeremy McKeel, director, Digital Media Services, Murray State University. Following the one-hour roundtable sessions students participated in a speed interview session. Students spoke with a professional for a brief amount of time and moved to the next professional when time was called. Gill Welsch, head of the advertising major, served as coordinator for this event. The name was the original name of The Murray State News. As part of the class and the student media organization, student journalists are provided an experiential learning opportunity by creating an online newscast, which airs on Mondays each week during the semester. The students are responsible for all aspects of the show under Anderson’s guidance. The course brought back the “Murray State Minute,” a one-minute news update that airs on Fridays. Both can be found at Facebook.com/themurraystatenews. The spring semester class will sell ads to make possible the use of a smartphone app to provide directions, schedules and enrollment information for the 2018 Summer Orientation program. JMC 426 students regularly bring in more than $30,000 each year to support MSU print products used in enrollment and recruitment activities. The top graduating seniors were recognized at the department’s annual honors banquet. From left: Kyara Roberson, advertising; Abby Siegel, public relations; Shelby Smithson, journalism; Dr. Debbie Owens, chair; Adam Loehr, TV production; Alissa Sommerfeldt, public relations; and Brandi Gooch, graphic communications media. Allie Douglass, outstanding graduate student, is not pictured. Seven graduating students were recognized as the top students in their majors at the JMC department’s spring honors banquet April 26. Those receiving this recognition were Kyara Roberson, Shelby Smithson, Abby Siegel, Alissa Sommerfeldt, Adam Loehr, Brandi Gooch, and Allie Douglass. Roberson was named the outstanding senior in advertising. She was a graphic communications technology minor. She had served as a social media intern for Bundles for Queens. Roberson was a member of Ads Club. Smithson was the top student in journalism. She was a TV production major and journalism minor. She was a member of TV Club, Alpha Gamma Delta, Campus Activities Board and The Winner’s Circle. Siegel was one of two outstanding seniors in public relations. She also majored in nonprofit leadership studies. She was an organizational communications minor. She worked as news editor for The Murray State News and as a writer for Gateway Magazine. She was a member of the Public Relations Student Society of America, Honors Student Council, Baptist Campus Ministry, Racer Rowing, National Society of Collegiate Scholars, president of Wave with Living Waters for the World, and a Peace Corps ambassador. Sommerfeldt was one of two outstanding seniors in public relations. She was an advertising minor. She had public relations internships with Murray State’s Alumni Association and the University’s Office of Development. Her off-campus internships included Caterpillar Inc., VoiceBox Media and Owensboro’s RiverPark Center. She was a residential advisor in Elizabeth Hall and a Summer O counselor. She served as president and vice president of the Public Relations Student Society of America, participated in the University’s Student Ambassador program, and was a member of the Phi Kappa Phi honor society. Loehr was the outstanding student in TV production. He was a theatre technical/design minor. He was active in the TV Club. Gooch was the outstanding student in graphic communications media. She was an art/graphic and web design minor. She was a freelance graphic and web designer. Douglass was named the outstanding mass communications graduate student. She had received her bachelor’s degree in graphic communications management/photography from Murray State in 2012. She had worked as a photographer for the Paducah Sun, a public relations specialist for Murray State, and was the University’s visual communications coordinator. She was a member of Phi Kappa Phi, Leadership Women, MSU Residential College Task Force, and the Elizabeth College advisory council. In addition to the top seniors, the departmental clubs and organizations recognized the achievements within their groups. Kappa Tau Alpha inductees were named during the banquet. A Murray State University student and an alumnus recently won awards from the Kentucky Associated Press Broadcasters college competition. Piper Cassetto, a freshman television production major, won second place in the Best College Videographer category for her story “Clear the Track: the Legacy of Racer One. Parker Franklin, a May 2016 graduate with a degree in journalism, won third place in Best News Story in the radio division for his story “How Universities Address Kentucky’s Doctor Shortage.” The piece aired on WKMS. Franklin is now a reporter with the Murray Ledger & Times. The Kentucky Associated Press Broadcasters competition is designed to recognize outstanding performance in broadcast journalism among Associated Press members. The competition is open to AP members in Kentucky and outside Kentucky with designated market areas that extend into the state. Twelve of the 99 MSU seniors selected to the 2017-18 “Who’s Who in American Colleges and Universities” had majors in the Department of Journalism and Mass Communications. They were Mackenzie Chapman, Austin Gordon, Julie Graham, Ashley Horn, Connor Jaschen, Victoria (Tory) Lanaghan, Allison Laski, Abbey Malone, Nicole Schulenburg, Rachel Solomon, Kayla Speis, and Jaclyn Whoberry. Chapman was a public relations major with a minor in advertising. She worked for The Murray State News and was the social media coordinator for Regents College. In summer 2017, she interned with TPN in New York City. Gordon is a graphic communications media major and a marketing minor. He is the ad production manager and online editor for The Murray State News and Gateway Magazine. He interned with Designory in Chicago in summer 2017. He is a member of Ads Club, Public Relations Student Society of America, Gamma Epsilon Tao honor society. He is the director of multimedia for Student Government Association and vice president of volunteering for Omicron Delta Kappa. Gordon has won several awards from the Kentucky Press Association for his work with The News. He plans to graduate in May. Graham is a public relations major and an organizational communication minor. She was an account service intern for Paradowski Creative in St. Louis. She was a member of the Public Relations Student Society of America, Lambda Pi Eta, the vice president of public relations for Kappa Delta, and the vice president of finance for Panhellenic Council. She was a consultant for the Racer Oral Communication Center. Graham plans to graduate in May. Horn was a public relations major and an advertising minor. She worked for Murray State’s Office of Branding, Marketing and Communications and the University’s Education Abroad office. She interned with TBWA/World Health in Chicago in summer 2017. She was part of the University’s dance company and a resident advisor. Horn graduated in December. Jaschen is a public relations major and a political science minor. He is the editor in chief of The Murray State News. He had a public relations internship with Diversified Agency Services in New York in summer 2017. He is a member of Ads Club, Student Government Association and the Sigma Pi fraternity. He plans to graduate in May. Lanaghan is a public relations major and a creative writing and Spanish minor. She worked with Racer Relations. She was a marketing and social media management intern for the National Foundation for Ectodermal Dysplasias in Fairview Heights, Ill., social media content manager for the Sisters of St. Benedict in Ferdinand, Ind., and a development and social media management intern for Whole Kids Outreach in Ellington, Mo. She was the vice president of the Public Relations Student Society of America, president of the Elizabeth College residential college council, and treasurer and leadership chair for Lambda Zeta Omicron. She is an adult leader for the St. James youth ministry. Lanaghan plans to graduate in May. Laski was a TV production major and an advertising minor. She was the chief videographer at The Murray State News. She was a videographer at Bluegrass Downs’ horse track. She was a production assistant at 180 Degrees Productions LLC. She was a member of TV Club. Laski graduated in December. Malone is a public relations major and a legal studies minor. She worked for The Murray State News in advertising sales. She was a regional account intern at BBDO Atlanta in summer 2017. She was a sales associate and handled social media for Ladybugs Boutiques. She was a member of the Public Relations Student Society of America, Order of Omega, National Greek Honors Society, and Student Ambassadors. She was the philanthropic chair for Alpha Sigma Alpha and the membership chair for Campus Activities Board. She also worked with Special Olympics, Girls on the Run, Toys for Tots, the S. June Smith Center, and Best Buddies. Malone plans to graduate in May. Schulenburg was a public relations major and marketing minor. She worked for The Murray State News. She was a member of the Public Relations Student Society of America, Kappa Tau Alpha national honor society, Kappa Delta, Order of Omega Greek honor society, and the National Society of Collegiate Scholars. She was a marketing intern for Make-A-Wish Missouri. Schulenburg graduated in December. Solomon is a graphic communications media major and an advertising minor. She works in ad production at The Murray State News and Gateway magazine. She is a member of Alpha Omicron Pi and Gamma Epsilon Tau. She is a youth leader at New Bethel Missionary Baptist Church. Solomon plans to graduate in May. Speis is a public relations major and advertising minor. She is the publicity director for the Public Relations Student Society of America. She is a member of Sigma Sigma Sigma sorority and a coach for the Murray-Calloway County Soccer Association. Speis plans to graduate in May. Whoberry is a public relations major and a marketing minor. In summer 2017, she was an intern for DDB New York. She is a member of Kappa Delta, Student Government Association and Student Ambassadors. She works for Racer Oral Communications. Whoberry plans to graduate in May. Half of the Who’s Who nominees from the College of Business were JMC students. 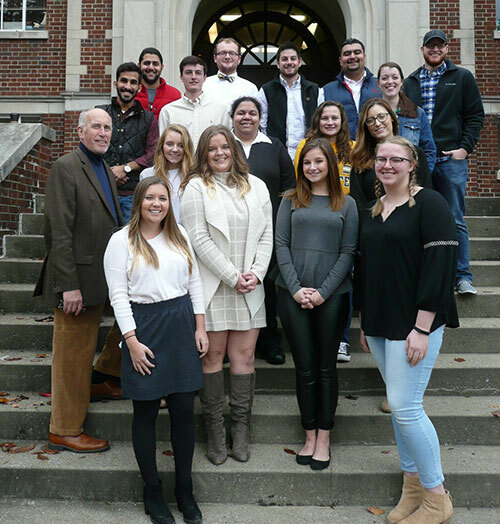 Eleven Murray State University journalism and advertising students recently received training in digital media strategies thanks to an opportunity afforded by a QEP Bring Learning to Life grant. Leigh Wright, assistant professor of journalism and mass communications, heard about the Lexington Herald-Leader’s successes with digital advertising campaigns during a retreat of the Kentucky Press Association board. She then formed a partnership with fellow board member Kim Woods, vice president of marketing and advertising for Herald Media. Austin Gordon, right, looks over an assignment with fellow student Amanda Swift during a training session at the Lexington Herald-Leader offices. Wright received a grant from the QEP Bring Learning to Life program. The grant allowed 11 students and three journalism professors to receive training in multimedia news coverage, digital advertising and marketing strategies and social media strategies for news and advertising from the Lexington Herald-Leader staff. The training day consisted of two tracks: advertising and news. 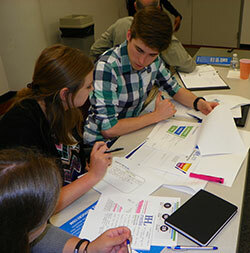 For the advertising track, students learned about digital products and how to manage a digital advertising campaign. For the news track, students learned photography and videography techniques for one session. Editor Peter Baniak and columnist Tom Eblen discussed the role of social media and the need for verification, and Baniak concluded the session with lessons on how his paper uses analytics to determine social media strategy. Wright, Gill Welsch, senior lecturer of advertising, and Bob Valentine, senior lecturer of advertising, accompanied the students. Students who work at The Murray State News have already started to train the newspaper staff in some of the techniques they learned. Heather McGinnis, senior director of digital and client success at Herald Media, said the staff enjoyed a chance to share their knowledge and inspire college students. The Bring Learning to Life grants strive to improve experiential learning outcomes through the implementation of learning experiences in which students apply the principles learned in the classroom to real-world settings. John Morris runs camera during the StudioXPerience internship at the National Association of Broadcasters convention in Las Vegas. Morris is a 2017 graduate of Murray State University. When an injury sidelined John Morris from his dream of playing four years of college football, he decided to look at the positives. Morris, of Nashville, Tenn., chose to use his year as a chance to earn experience in his fields of television production and journalism. With his athletic schedule for the past three years, he had not had opportunities beyond the classroom to gain experience he needed for his career. That all changed with the opportunity afforded to him through the 2017 StudioXperience internship through Waskul.tv at the National Association of Broadcasters conference in late April in Las Vegas. Morris was one of five students chosen to participate as production interns through a national application process. The application required Morris to write an essay that outlined why he wanted to intern as well as a recommendation letter from a professor. During the weeklong trade show, Morris ran camera, edited video and audio and interviewed one of Waskul.tv’s leaders. “As far as the expectations of what they asked us to do, I felt very well prepared,” Morris said. Morris graduated in May with a bachelor’s degree. His major was television production with a minor in journalism. Morris made business cards before his internship to brand himself as a multimedia journalist and hopes to land a job soon. He praised the Murray State television production and journalism sequences for preparing him with the current technology for video production and multiplatform journalism. As the internship neared the end, Waskul.tv leaders asked him if he would mind helping on camera and allowed him to do interviews. “You’ve got to be able to multi-task,” Morris said. 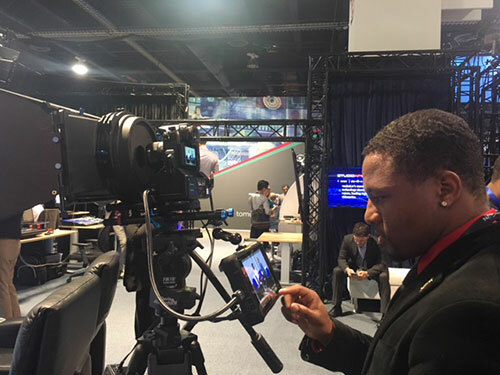 Besides the hands-on experience at the NAB show, Morris said the networking helped him make connections that he otherwise may not have made. Television industry leaders visited the booth at the show. Leigh Wright, assistant professor of journalism, nominated Morris for the internship. She said she thought of him when she saw the call for the internship through the Broadcast Education Association and decided to nominate him. Creative Use of the Newspaper, second place–Austin Gordon. Ryan Alessi and Joe Hedges were co-advisers of the paper for the spring 2016 semester. Stephanie Elder Anderson became The News’ adviser in the fall 2016 semester. Three JMC students attended a storytelling workshop featuring Al Tompkins of the Poynter Institute at the spring meeting of the Kentucky Associated Press Broadcasters. During the workshop, Tompkins showed students how to create videos on their phones, how to create easy social media graphics from their phones and how to craft effective broadcast news stories. Tompkins, a Fredonia native, attended Murray State University before transferring to Western Kentucky University. His career as a reporter and news director extended from Paducah to Nashville, Tenn. He is now the senior faculty member at the Poynter Institute in St. Petersburg, Fla. Participating students were Emily Hancock, a sophomore television production major from Bumpous Mills, Tenn.; Allison Laski, a senior television production major from Lexington, Ky., and Ashley Traylor, a sophomore television production major from Birmingham, Ala.
Dr. Melony Shemberger and Leigh Wright, assistant professors of journalism, accompanied the students. Additionally, Wright began her term as a board member for the Kentucky Associated Press Broadcasters during the meeting. Copyright © JMC Journal.Original News Theme by .